Tezpur University was established on January 21, 1994 by an Act of Parliament of India, the Tezpur University Act, 1993 (Act No. 45), as a non-affiliating and residential Central University The academic programmes offered in the University have a distinct focus on science, technology and humanities, reflecting the objective of the University. At present, the University offers Doctor of Philosophy programme in 19 disciplines, Masters programme in 26 disciplines, Post-Graduate Diploma in 3 disciplines, B.Tech. in 6 disciplines, Certificate programme in 3 disciplines, Integrated M.Sc. in 4 disciplines, Integrated M.Com., Integrated B.Sc.B.Ed. in 3 disciplines, Integrated M.A. in one discipline, Integrated B.A.B.Ed. in one discipline, two-year B.Ed. Programme, B.Voc. Programme in 2 disciplines and one diploma programme under Community College. The University offers Add-on courses on Yoga and Violin too. Reservation and relaxation: As per the Govt. of India rules. 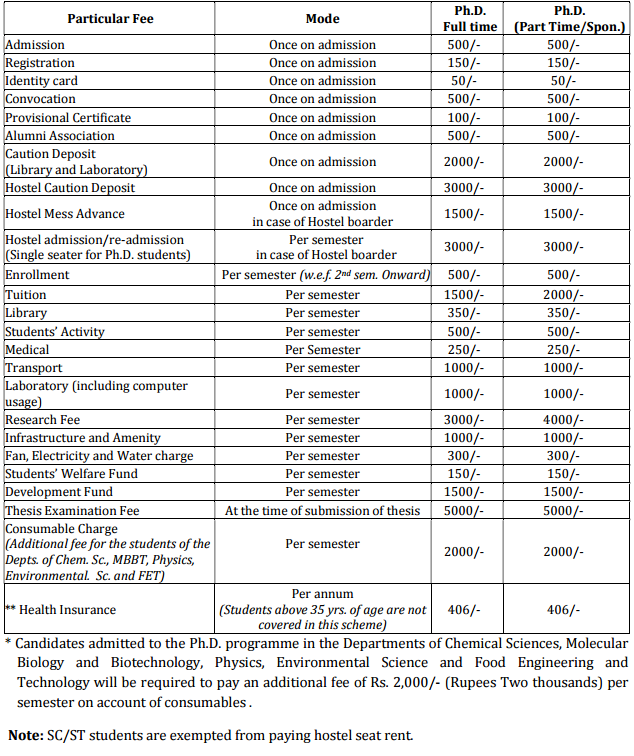 Self Supported Scheme : Tezpur University has a provision for admission under Self Supported Scheme (SSS). The waitlisted candidates shall be eligible for the admission under SSS with additional fees. However, the admission will be on merit basis. Tezpur University conducts an entrance exam for admission to various courses. The University offers admission to various courses s on the basis of their performance in entrance exam. Candidates interested in admission at Tezpur University can check its complete details from the link below. The academic programmes offered in the University have a distinct focus on science, technology and humanities, reflecting the objective of the University. Tezpur University will released notification from eligible candidates to admission in various courses for the academic year 2018-19. Tezpur University offers a number of programmes on Under-Graduate Degree/Diploma/Certificate, Post-Graduate Degree/Diploma and Doctor of Philosophy Degree in various Disciplines. Admission to most of these programmes will be held through entrance examinations conducted by the University in various centers across the country.This year(2018-2019 session), the University will conduct the entire admission process (application submission, entrance examinations, counselling/admission) through online-mode only. (i) Integrated B.A.B.Ed. 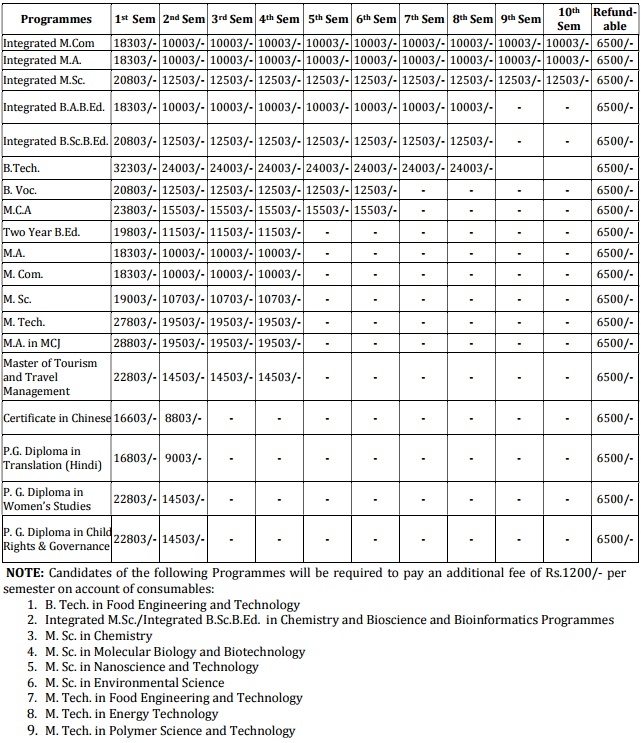 (Major in English), Integrated B.Sc.B.Ed. 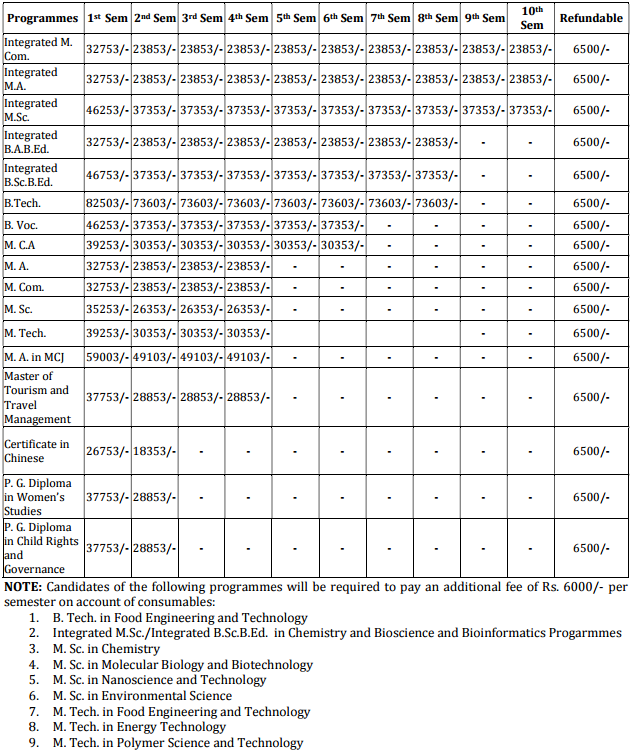 (Major in Chemistry/ Physics/ Mathematics), (ii) Integrated M.A. in English, Integrated M.Sc.in Physics/ Chemistry/ Mathematics/ Bioscience and Bioinformatics, Integrated M.Com. (iii) M.C.A., (iv) M.A. in English/ Linguistics and Language Technology/ Linguistics and Endangered Language / Cultural Studies/ Sociology/ Mass Communication and Journalism/Communication for Development/Hindi/ Social Work and Education, (v) M.Sc. inMathematics/ Chemistry/ Physics/ Nanoscience and Technology/ Environmental Science/ Molecular Biology and Biotechnology (vi) M.Tech. in Information Technology/ Food Engineering and Technology/ Electronics Design and Technology/ Bioelectronics/ Energy Technology/ Polymer Science and Technology, and Mechanical Engineering (vii) P.G. Diploma in Child Rights and Governance (UNICEF sponsored) / Translation (Hindi)/ Women’s Studies (viii) Certificate in Chinese (ix) B. Voc. in Renewable Energy Management / Food Processing (x) Master’s of Tourism and Travel Management (xi) 2 – year B. Ed programme. Programmes: B.Tech. in (i) Mechanical Engineering, (ii) Civil Engineering, (iii) Electronics and Communication Engineering, (iv) Computer Science and Engineering, (v) Food Engineering and Technology (vi) Electrical Engineering. Candidates will be selected for admission on the basis of performance in the JEE (Main) conducted by the CBSE. For details please visit JEE website: www.jeemain.nic.in. Approximately 60% of the seats will be filled in by the candidates of NE states. The candidates of NE states qualifying in the JEE (Main) should apply to this University for admission against seats reserved for NE domicile candidates for which counseling will be held at Tezpur University. The remaining 40% of the seats will be filled in through the Central Counseling conducted by the CBSE. For this no separate application is required. Candidates from NE states securing one of the top 5 positions in the examination conducted by the Higher Secondary Board/Council of the state with an aggregate of 85% or above marks will be directly admitted to the B. Tech. programme. 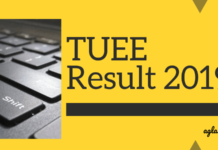 Candidates from NE states securing one of the top 10 positions with an aggregate of 80% or above marks will be directly admitted to Integrated programmes. Applicants of M. Tech. programmes with valid GATE score may apply for direct admission without the Entrance Examinations provided they meet the cut-off score. Offering Departments :Business Administration, English and Foreign Languages, Cultural Studies, Sociology, Chemical Sciences, Physics, Mathematical Sciences, Molecular Biology and Biotechnology, Environmental Science, Computer Science and Engineering, Civil Engineering, Electronics and Communication Engineering, Mechanical Engineering, Food Engineering and Technology, and Energy.. Admission will be on the basis of the performance in the written test and personal interview. Written Test will be conducted in different centres along with other UG/ PG programmes. Personal Interview of the short listed candidates will be conducted in the respective Departments. The panel of candidates short listed for PI in the Autumn Semester, 2018 will also be valid for the Spring Semester, 2018. No separate entrance test will be held for admission for the Spring Semester, 2018. List of the candidates short listed for Personal Interview will be displayed on the Tezpur University website. No call letter will be issued separately. Pre-requisites for admission and area of research are given in the Tezpur University website www.tezu.ernet.in.